While We Have a Pope contains an interesting idea for a film, it ultimately fails to portray the struggle Cardinal Melville is going through, which is the centerpiece of the entire film. It’s an event that’s only happened once thus far in my lifetime: the election of a pope. Thousands of people crowd St. Peter’s Square in Rome as the College of Cardinals votes on who is to become the new Supreme Pontiff. The crowd eagerly awaits the releasing of smoke that tells them whether or not the vote was successful, black indicating that it was not, while white indicates that a new Pope has been chosen. As head of the church, the papacy comes with much responsibility, but what if the one elected felt that they were unable to fulfill those duties? 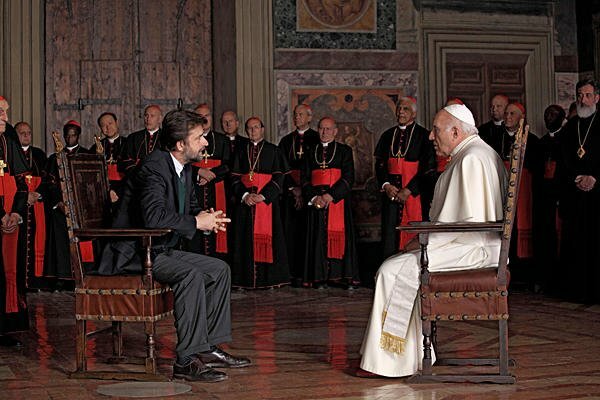 Such is the topic of Nanni Moretti’s We Have a Pope. The film opens with the precession of the current pope’s funeral. The College of Cardinals gathers to elect the next Pope with certain candidates standing out as favorites, but many of them seem unsure as to how to vote. The first round of voting doesn’t produce the two-thirds majority needed to declare a winner, so a second round of voting is performed, resulting in a large majority of votes for Cardinal Melville (Michel Piccoli). He is understandably overwhelmed as he was not one of the favorites who was thought to have a chance at election. It turns out his feelings of being overwhelmed are much worse than originally thought as right before he is to address the crowd gathered in St. Peter’s Square, he proclaims that he can’t do it and rushes away to be alone. This leaves the other cardinals in a bind as to what to do, so they decide to bring in a psychoanalyst (Nanni Moretti) to try and help out. However, things become even worse when the newly-elected Pope decides to run away. The first act of We Have a Pope is rather interesting in that we get to witness the process of the papal election. It can’t be an easy thing for a relatively small group of men to elect the next supreme head of the church and it shows in their difficulty in writing down their choice. Then it moves on to the fascinating scenario of the elected pope feeling that he can’t do what is required of him. This kind of scenario is one that could make for a very interesting and engaging film. However, something very peculiar happens as the film progresses. As it proceeds into its second act where the pope runs away from the Vatican, it feels as though the film shuts down. You could even say that it goes on hold, much like the cardinals who wait for the new pope to address the crowd. During this time, Cardinal Melville roams through Rome as he tries to come to terms with having been elected, a weight he obviously finds very heavy to bear. This is where the film began to feel rather empty. It’s trying to show us that he’s having difficulty bearing this weight, but it’s never able to portray that very well. I don’t fault Piccoli for this as his expression is the biggest hint we have during this time of wandering, but rather the writing that doesn’t give him much to say or do to express his inner turmoil. The peculiarity continues back at the Vatican as the therapist, forced to stay within its walls due to knowing the identity of the new pope, attempts to find things to do along with the cardinals, none of whom are aware that the pope has run away. This eventually leads to the therapist organizing a volleyball tournament. It was a rather strange decision to concentrate on this bizarre event so much while the real struggle of the film is occurring with Cardinal Melville himself. Perhaps Moretti was just looking for an excuse to get himself into the film more. The film does get around to showing us the decision that the new pope has made, but with the struggle not being shown all that well, we are still left with the sense that a lot of time was wasted between the first act and the conclusion. This is certainly a great idea for a film, it just needs better execution, less stalling for and wasting of time, and a better means of showing the difficult period that Cardinal Melville is going through, none of which can be accomplished with a cardinal volleyball tournament.